Back in the day when I had no real clue what a budget actually was, summer could quickly become a frustrating time. We felt like we had this beautiful weather, but couldn’t go and do anything because we didn’t have any money. Now that we are out of debt, we love finding ways to save money on vacation. Just the other day I posted on my Instagram Story about a killer deal on a Disney vacation!! The key is planning! Start saving now for your vacation next year. You will be surprised on how quickly a small $10 weekly savings can add up! I could write an entire article on how to budget for a vacation when you don’t have any extra money. Would you be interested in reading that? Let me know down in the comments and I might get that together for you if you want! Your vacation budget doesn’t need to be big whatsoever! You can get creative. One of our family’s very favorite ways to vacation on a budget is to go camping! You might be lucky enough to live somewhere you can just find a place and camp for free! But even if that’s not you, most campgrounds are super affordable coming in around $10-$15 a night. To plan a guilt free camping trip, I have created a FREE Budget Starter Kit to help you! To help make your camping experience a little more enjoyable and comfortable, I have rounded up a few camping hacks for you! BONUS all the supplies needed can be found at the dollar store! Have a look at this video to get all the tips for your next camping trip! P.S. 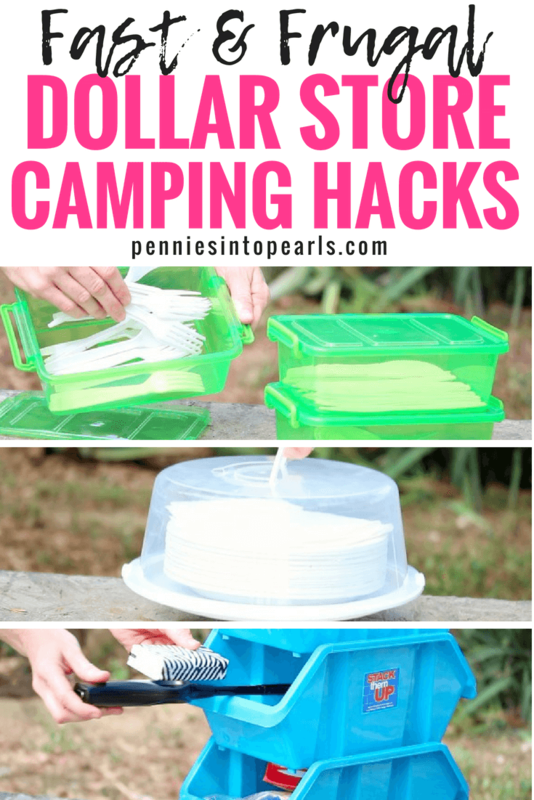 If you liked these hacks you are probably going to love some more hacks I shared all about Dollar Store Road Trip Hacks!! Darlin’ I love this!!!! The cake container for the paper plates is GENIUS!!!!!! You literally just solved one of our biggest issues with camping! 🙂 Thank you! You are the sweetest Jessi!! And yes!!! It works like a charm!! We camp several times a summer and I love being able to stay somewhat organized! Haha! Here is a TIP from me: Example: Dollar store hook might not stick real good if not don’t despair Just add a touch of what I call the miracle adhesive will stick to almost any suffice can be remove without damage if done right! Ready? I love this stuff and that is a good old hot glue gun and glue! Bye take care. I would be very careful with the hot dog sticks! The handle is not very long which means your kids will be very close to the fire. Most sporting goods stores have longer handles on their sticks! I found a collapsible dish drainer at Menards last year on clearance. 15″ x 11.5″ Collapses to approx. 2″ high. Does a great job and saves space. That’s a great idea for camping!!!! Love your ideas! I found with the picnic table clamps that all picnic tables are not created equal so sometimes the clamps do not fit. To solve the problem I use a twin size sheet. The elastic allows for multiple sized tables and prevents the wind from blowing off the sheet.